Our friend called it a Durant-Star but frankly I'd never heard of that make. Two men bought the car in San Antonio in the 1950's and then brought it back with them to Bandera, Texas, where it was dismantled and stored in an airplane hangar. In November 1977 the car was sold to settle the estate of the two men which had both died suddenly and that's when we purchased our 1928 Star model M coupe. After we had relocated all the parts to our own shop and had time to look at them, we figured we had made one hell of a mistake. The metal looked good but not one stick of wood was usable in the car. Erwin Anderegg, a good friend and fellow restorer with 4 restored cars under his belt, helped get our enthusiasm going. We removed the motor from the chassis and took it to Dallas where my brother-in-law has a machine shop and got him working on that aspect of the project. For us, the next three months were spent sandblasting and priming all the metal parts of the car. We bought 360 board feet of Ma7gnolia as we would end up replacing nearly every piece of wood in the car. We used the old pieces for patterns whenever possible but many times had to shape and fit the piece as we went. The hardest part was making new body sills. We assembled the body as best we could, making sure the parts fit as they should, and then slipped a piece of plywood under the body and traced out a pattern on the plywood. In time the body would come to life but it was a long tedious process. While work was progressing on the body the wood wheels received several coats of marine varnish, new tires and eventually found their way to a completed chassis. The body was added and although progress was evident there was still a long way to go. A fellow member in the local club installed a new top, while new glass was added and the body work was begun. The painting and sanding was by far the worst job we faced. The body has 9 to 10 coats of acrylic lacquer and if I say so myself the paint job is the most eye-catching part of the car. A local upholsterer (a woman) did a beautiful job replacing the tattered interior with a light beige material exactly like the original. 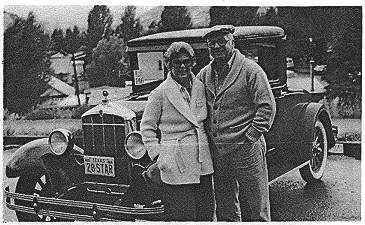 Except for minor items like hubcaps, radiator cap and one door handle, the car was finished just two days before we left on the VMCCA National Tour to Jackson Hole, Wyoming in August of 1978.Mountain highways and the Tetons gave the car a real break-in. We'll be in Flint in 1981 If we can get the gas! The 1928 Star is a very rare model and Jack has the only true 1928 Star with the oval radiator emblem that we know of at this time. It was offered in the latter part of 1927, only as a four cylinder car and replaced with the Durant-Star early in 1928. We'd be interested in learning more about the 1928 Star line and would like to hear from you if you have info. Homer Bowman shared the picture above (one of three found at a garage sale!). That's the Seattle, Washington Durant agency on 333 E. Everett Avenue taken in the spring of-1929. A 1924 Star sedan is visible behind the 1928 Durant on the side street with a 1929 Durant parked in the front as well as several new" Durant cars on the showroom floor. We'd like to know more about this agency if we have a volunteer in the Seattle area.